Blogging Marathon# 30: Week 2/ Day 2 Theme: Get it Rolled Dish: Chana Dal Kebabs Day 2 of BM# 30 and today's dish under 'Get it Rolled' theme is Chana dal Kebabs. When you think of kebabs, you think of skewers and meat. 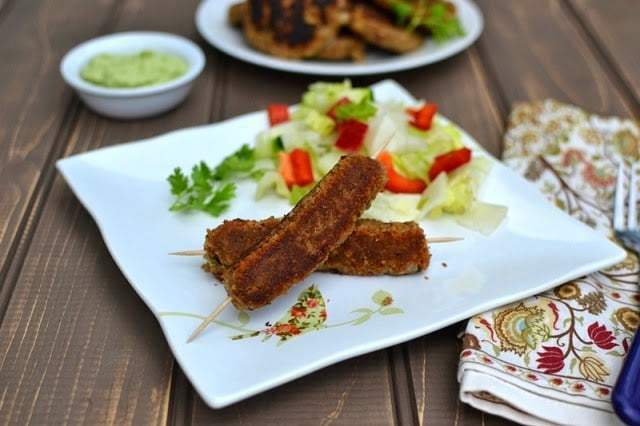 Here's some Wiki gyan about Kebabs - 'Kebab is derived from the Arabic word 'kabab' which means to 'fry'. I especially like this story about the origin of kebabs -- Persian soldiers used their swords to cook meat on open fire and hence started the 'kebab' way of cooking meat. Take the beans in a blender and grind them to an almost fine paste. Some texture is fine. Take this mixture into a bowl. In the same blender, blend the bread slices to coarse powder. Reserve about ¼cup of bread powder and add the rest of it to the bean mixture. Add all the other ingredients to the bean mixture and mix well to form a slightly sticky dough. If it is too sticky then add the reserved bread powder. Roll the dough around a kebab stick or skewer (alternately form into patties); cook on a preheated skillet with a touch of oil until all the sides are evenly cooked and turn golden brown.